Ivorian striker Ephrem Guikan’s 34th minute opener was cancelled out by Joe Waithira goal on 64 minutes before Boniface Omondi restored Gor’s lead in the 72nd minute. Substitute Jacob Faina struck at the death to draw Nakumatt level, leaving Gor Mahia fans that had turned up for the match stunned. However, it was the return of Burundian right back Karim Nizigiyimana after almost eight months out nursing an injury that eclipsed the proceedings on the pitch, after he replaced birthday boy Kevin “Ade” Omondi with six minutes to go. The draw, which was Gor’s fifth in 22 league matches this term, leaves the champions 16 points clear of second-placed Sofapaka while Nakumatt now have 29 points after 25 matches. 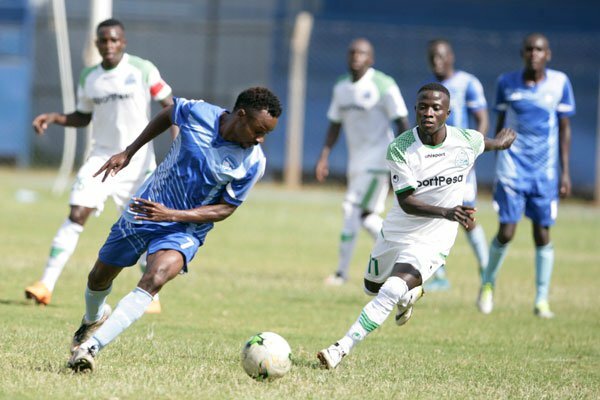 The travel-weary Gor have three games in the next seven days against Bandari (Tuesday), Posta Rangers (Friday) and Chemelil Sugar (Sunday) while Nakumatt visit AFC Leopards. “It’s hard luck, we did everything we could to get a win in vain, we keep the focus heading into the next match,” said Gor midfielder Philemon Otieno, who was handed the armband in the absence of skipper Harun Shakava. Nakumatt coach Medo Melis hailed his charges for their fighting spirit. “We deserved to win, tactically both teams were superb and we lost a lot of scoring chances in the first half. We need to work on our finishing,” said the Egyptian-born American. Gor Mahia XI: Shaban Odhoji, Wellington Ochieng, Charles Momanyi, Joash Onyango, Wesley Onguso, Bonface Omondi, Samuel Onyango, Lawrence Juma, Philemon Otieno, Kevin Omondi and Ephrem Guikan. Subs: Francis Mustafa, Fredrick Odhiambo (GK), Eliud Lokuwam, Bernard Ondiek, Raphael Osudi, Cercidy Okeyo and Karim Nizigiyimana. When I said Shaban Odhoji will never be the answer to Gor Mahia’s goal keeping problems,I was drowned out by the Oluoch lynch brigade and one blogger suggested that I had to be related to Oluoch to even consider saying that. Odhoji has conceded so many goals per match ratio and any objective analyst only needs to go look at the statistics. They never lie. Even if Oluoch has regressed and is committing schoolboy errors,there is no day Odhoji is going to be better than him. I had said that those clamouring for Odhoji to take the gloves may just get their wish and I told them that we compare notes at the end of the season. Now your wish has been granted and I see Odhoji being preferred in the forseeable future but we may be forced to compare notes earlier than the end of the season I had indicated. When you said, when you said… so was Odhoji the problem? Were the goals scored as a result of his mistakes? Did you even watch the match? Yes Sir, I watched the match!!! I can see you are training hard to become a prophet. So what do you mean by “When I said this when I said that…”? This site has adult brains which can’t bow down to your cheap situational score cards. To add insult to injury, you are in a hurry to post such (primitive) comments even though you didn’t watch the match. Oh my goodness! Join the likes of Kanyari in prophesying the return of Kagere season 3, at least that will make you a better asset to this site. Myopia is both an optical disability and a state of mind.!! Point on @ Musymo. You can’t compare Kenya 1 with Odhoji. After missing open glorious chances Gor players were finally punished for lack of concentration. I had to think twice before tearing apart Oluoch, today it was Odhoji who soaked in two. Anyway the draw is behind us let’s focus on Bandari game of which I hope Kerr will make necessary changes from today’s lineup. I still want to congratulate this team, you tried your level best and managed a point. Am cognisant of the fact that most first team players deserved a rest due to fixture congestion. Looking at the line up, I can’t castigate the players. The team lacked the regular staters and a draw is a much deserved result. The same team that drew nakumatt should be given more game time to gel and gain consistency. I didn’t watch the match but I doubt whether the goals against Gor resulted from goalkeeping errors. Those preaching anti-Odhoji sermons up there should better learn how not to show nursery school pettiness on an adult site like this. With a defence of Wellington, Joash, Momanyi and Karim, our resistance had to tested to the limit. Most of those who played this match are just coming from long injuries and layoffs. Let us learn to appreciate, not noise and pettiness all the time. The same injury prone players beat K Sharks 3-0 just the other day. If you are the adult you claim to be simply deconstruct my argument by showing where there is a fallacy. Short of that you are the petty one. Whenever one resorts to insults in response to a logical argument, there is only one fool, only problem is that their faculties can never process who it is!! @jakadianga, another good one. Where were they MAMA? Congratulations to the players, technical bench and the supporters. You did the best, being that you hardly play together. Nakumat is really improving game by game and was not going to be easy. Keep it up! May God bless K’ogalo forever. Glad to see Karim and wellington back to the squad. Congratulations to the boys ……..just grind out results (the local league is no match ) as 4 more points and the 2018 league is officially over. Infact, next weekend we could CHAMPIONS ELECT ! Do you really think the chasing pack is going to win all their remaining matches, Judging by their previous record, it is possible that of the ten matches to the end of the season (including round 25). The best of the chasing pack will register at most 5 wins, 3 draws and 2 losses translating to about 18 points for a final point tally of 56-58. One thing is clear none of the chasing pack will go beyond 60 points. Congrats to the boyz. The combination of playerz will soon gel. We understand this was not the known team. Nakumatt is also a team that is currently playin well… I would b suprised if they brag about the draw. Bonny kik chak bedie e goal.Even if Shaban concedes 100 goals in a match. Bonny’s compatriot in errors the Yanga keeper has been fired. He too should be fired now now. @Janam,how much do you pay to watch Mahia? @Janam, I do not think you are a Gor Mahia fan. Leave Bonny alone and take your nonsense to yourself. We are tired of reading your negative postings always. I’m not congratulating the draw but I’m thanking Kerr for giving a deserved rest to Shakava, Walusimbi, Wafula, Tuyisenge, Mieno, Wendo and Kahata. Those guys need some rest before embarking on the continental scene once again. As much as we have a winning streak to protect, these fringe players fielded against Nakumatt really deserve game time and thanks to the coach for fielding them. Continue fielding them even if we lose because the league is almost wrapped up. Happy to hear some names in that match day squad like Asudi, Wellington and Karim. Thanks for the draw. And oh, before I forget, when is Bonny joining Jerry in retirement? That should be sooner than tomorrow. Congratulations Team. Nakumatt W*s A Small Check On The Speeding Train But Who Can Stop Us? As For Those Know It Alls Whose Hobby Is To Pick Only Negativesz From Gor Games N Descend So Low As To Castigate Players I Say A BIG SHAME ON YOU! A game on Tuesday, Friday and Sunday. Surely that is just too much. He has conceded similar goals before. Against Thika Masakidi beat him with a similar strike. On to Mathare Francis Omondi scored from a similar situation. And we are in for a very long night!!! @Musymo CEASE FIRE please about the goalkeeping issue’s and as a matter of fact you under K’Ogalo far much better than this quacks you are engaging with. Let us focus on the bigger picture “CONQUERING AFRICA” and not the non issue’s that can be handled with the technical bench. It is true Bonnie blundered in DAR due to his casual approach but ODHOJi also is just as average or even worse but at the moment our concern should be how they regain their safe hands. Wise words @Trailer. I was just pointing out some facts that are backed by available statistics but I must have stepped on some toes. For your measured advice, I will cease fire. thanks Sir Kerr for team rotation. we continue being positive for good energy for the next game on Tue. with God all things are possible. God bless Kogallo..as Zig Ziglar says..stop when you finish..not when you are tired. As ardent fans, we also stand as Analysts and therefore must call out simple mistakes we observe. The second goal was a goal keeping error that seemsuniform to Bonny and Odhoji. poor judgment that must be urgently addressed if we are to objectively talk of conquering African football. My rare observation. I have the honour of acknowledging the presence of Ja Ngere. Friends, the return of Ja Ngere elates me much like the return of Dinga. Ja Ngere is one of the doyens of this site. He was privileged to grace this blog site with great minds like Ogango Trailer, Dan (Original), Oduor12, Pundit, Arrumtiddi, Vincent Ocampo, Nyarkogalo, Okoth Jabilo, Wuonpap, Agwa Kassam, Jakoyo, Jasawagongo, Ochigah and Gem Kendgi among others. On the current subject matter, I do not know what we shall achieve with the bickering. To be honest, I was disappointed with the draw. However, I differ with my good friend, Musymo regarding Odhoji. The man contributed so much in limiting the scoreline to what it reads now. Through his dives (which Boni doesn’t bother with anymore), Odhoji made three great saves in the first half and two in the second half. I am counting only the crucial saves that earned him a standing ovation from the fans. What was clear from the onset was that Nakumatt played with purpose, initially our midfield was disjointed with conflict of roles between Philemon and Lawrence. Overall Philemon had a disappointing afternoon by his standards while Lawrence picked only after introduction of Carcidy Okeyo in the second half. Samuel Onyango too didn’t rise to the occasion, hence the timely substitution. We therefore allowed Nakumatt much of the ball and they grew in confidence. Had we converted the many chances we got as early as the first minute, then we would have silenced them. Our defence was shaky from the beginning. The first Nakumatt goal came from a lapse in concentration in the midfield which ended up with our last man, Joash, being caught flat-footed. The same lapse in concentration cost us the second goal. A free kick taken, but our midfielders did not anticipate that it would be passed. They failed to pick their men (a similar free kick to the one Jausenge scored against Yanga). Gor Mahia players relaxed momentarily when one Nakumatt player went down and they expected the ref to blow for a foul. I must commend Odhoji because through his instincts and sharp reflexes, he managed to block the shot, but spilled it and a Nakumatt player who was always in an offside position even before the free kick was taken, hit the rebound. Ker pointed this out to the linesman and ref at the final whistle. In my view, let us continue encouraging Odhoji and the Rookie. There must be very convincing reasons why the recruiters felt that they are the best qualified to join this big team. Very good summary @BB. We lose some win some and even draw some. Some of us are perennial cry babies. Gor wins, draws or loses, they can never fail to fault this or that. Aooool yawa. Thank you Albert Kosero. My apologies for forgetting your name among the great minds who pioneered this blog site. The others include Mwakio and Pareyio Ole Lelerue. My apologies gentlemen. Thank you Albert Kosero. Please accept my apologies for forgetting your name among the greats who pioneered this blog site. My apologies go as well to greats Mwakio and Pareyio ole Lelerue. They were here long before I knew how to use a computer. While I support inclusion of Odhoji, I do not expect him to be James Bond from day one. This is the best way to learn. He now knows he has to better Bonny. On the other hand Bonny should work on his attitude more than anything. He should not think that his job is to only pick the easy balls n blame the rest on his defence… but he too should be treated fairly. Nobody liked the draw as you have said but we can pride ourselves that there is no other team that can field its bench side and get away with it. Me thinks that this the coach continue to give chances to the bench. The adventure as we have seen shall b bitter-sweet. Some will be 3nil, n some will be 2-2. To the bench side, strive to silence us. For how long do you want us to keep referring to you as the bench-side or the 2nd string. I withdraw my remark on your first comment. If you watched the match then I have no right criticizing ur comment. @Barefoot Bandit, you forgot Mwakio from Coast…where is this great fan???? @ barefoot bandit to God turudishe sifa. The game was ok.And kesho ni Mombasani Chino ya maji.Bora life. Alison Becker , the Brazilian world cup keeper and currently the most expensive goalkeeper in the world conceded 5goals in a single match and that is in the semis of the uefa champions league , the team that scored the five against him are the same one that went ahead to sign him I.e Liverpool . Before then , Liverpool had the exact problem we in K’galo are grappling with , they had Mignolet who blundered , guys n’goad reli and called for Karius to step in , Karius made an even bigger blunder and predictably a longer reli was uprooted but since the season was still at play , they had to accept that the two are all they got . Now whether we like it or not , the goalkeepers we are all for and against and including Odhiambo are all that we got for now uptil the opening of the transfer window . As opposed to as the fans who only see the players during game time , the beauty is that the one who will make the call as to who starts between the sticks is the man who is with the players 7days a week and that is the coach , and am confident that he will make the right call with what we have . As to yesterday’s game , the positives is that the team still managed to grind out a result despite an underwhelming performance and like one blogger alluded earlier , I concur that the team that played yesterday be retained for the next game , to continue gelling and to atone for yesterdays performance . Otherwise on the field til now , mambo iko tu sawa despite the punishing schedule , a schedule that not even Madrid and Barcelona can manage . BREAKING….Olunga is a free agent in China. Can EC please act, where are the brokers ? Jasego…heheheeee, Pinchez 25? I am tickled, that is football age like the Nigerians do it at 40. But let Pinchez kula ugali bwana. On Olunga, he should look out there, he is still marketable, is it that Girona did not want to absorb him on a longer contract? Engineer Olunga Ogada should not loose hope or focus at this time in his career. I believe he has the quality just lacked a believing coach and right atmosphere like he had in Djurrgadens IF in Sweden. That is why i always caution young upcomng players against looking far east to china so early in their careers. China is a retiremeny destination not ideal for building upcoming talent. All the same he will get a good team i pray but on Jakoyo wanting brokers to bring our former hitman home i would not encourage it. The boy deserves to go far in his career maybe even achieve his Arsenal dream so bringing him back to where he began is counter productive..Plus how do we even pay the salary he is now used used to getting in the professional ranks? No disrespect to our league,but Olunga is above playing at this stage. At his level and age,he deserves to be playing in the big league!! We need to encourage him further!! Tomorrow’s game against Bandari will be the litmus test for Gor and will be a good dress rehearsal for our game against Rayon. The reason is because Bandari is on top of their game and has the best defensive record, even better than ours. Feli and Shikalo are good and only Gor has scored more than one goal against them. They are also feeling motivated by their results. This means that beating Bandari tomorrow will be a bigger motivation than the bragging rights against ingwe, From the last two results at Mbaraki we have always emerged victorious. Not sure if that fixture ever ends in a draw. WISHING THE BOYS A GREAT WIN TOMORROW AT MBARAKI AGAINST A RESILIENT BANDARI! IN VICTORY AND GLORY, IN DEFEAT AND AGONY, KOGALO FOR EVER!! Only Walusimbi Godfrey can stop Bandari. That i know beyond reasonable doubt. Goodluck Mayienga SGR gol ngato e reru iwit kucha kiny….